The use of a Raspberry Pi is actually obligatory for such a project. Probably no other hardware platform is so well equipped with emulators. With a Retropi distribution, you have all the classics at once. Where the “newer” consoles such as a Sega Dreamcast should not be so much fun on the Raspiboy. Since only a Rasperry Pi Zero is installed, the small box lacks a little bit of power. The small size demands its tribute. Who is however fan of a maximum of 16bit consoles should be completely satisfied. The interface board is self-developed by 8b craft. The pcb you see in the video is soldered by themselves. The battery has 2000mAh. According to the initiators you should be able to indulge your hobby without interruption for about 4 hours. An upgrade to a 5000 mAh battery for 10 hours of gameplay is conceived and will probably be for an extra charge of about 10 euros to get. And so we should talk about the price. The early Brid will be just 50 € plus ancillary costs. You have to put the Raspiboy together by your own, but it would be something you just have to take with you. There remains the question of the risk. The 3D model of the case should already be examined by a producer and considered for ok. Also the PSB layout is final and can be produced as it is. If you look at the video I believe you can trust that statement. Looks very thoughtful for me. For the production of the injection molds, at least 1000 pieces of the raspiboy have to be sold to the counter. So let’s keep our fingers crossed that this project gets enough attention. Because when a retro nerd first knows about it, he will probably not come around. And it’s Nicholas Day. The RaspiBoy Campaign is now live and you can make your pledge. The Super Early Birds for € 49 plus additional costs will be of course sold out fast. But the early bird for 59 € is also still a great deal. Even the 69 € for the regular RaspiBoy are not too much for the bids. Who diligently distributes the campaign into the world can hope for an upgrade of the battery from 2000mAh to 3000 mAh. If that is still too little just simply pack 12 € on top and gets a full 5000mAh charge. Of course, the RaspiBoy will get also significantly heavier. Out of the factory an 8GB SD card is installed. This should also be enough for even larger collections. For 7 € you can also upgrade to 16 GB. An interesting detail of the campaign at the end. The actual brain, the Raspberry Pi Zero, is not included. You have to buy it by yourself. At 5 $ this is not a drama. This circumstance is justified by the fact that every customer of Zero receives only one copy. Let’s keep your fingers crossed, that the funding goal of 50,000 € is quickly cracked. 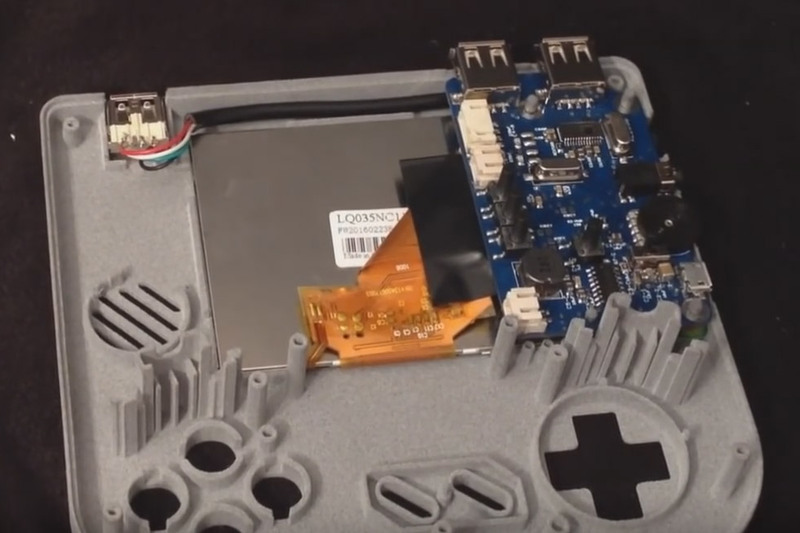 The Raspiboy is a handheld with a Raspberry Pi Zero for retro console emulation.